Syria's chemical weapons must be destroyed or removed by mid-2014. Obama: force still an option. 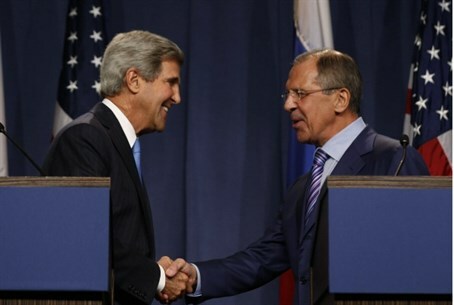 Secretary of State John Kerry and Russian Foreign Minister Sergey Lavrov have reached an agreement on a framework for securing Syria's chemical weapons, according to which Syria's chemical weapons must be destroyed or removed by mid-2014. The agreement was reached after three days of intense negotiations in Geneva. Syria must hand over a full list of its chemical weapons stockpile within a week or United States and Russia will seek a United Nations Security Council resolution against it backed by the threat of sanctions or military force, Kerry and Lavrov said at a news conference Saturday. Kerry said the negotiators had reached "a shared assessment" of the existing chemical weapons stockpile in Syria, and that these must be destroyed. A spokesman for the U.N. Secretary-General Ban Ki-moon said after the announcement: "The secretary-general looks forward to learning more of this framework agreement and pledges the support of the United Nations in its implementation. The Secretary-General expresses his fervent hope that the agreement will, first, prevent any future use of chemical weapons in Syria and, second, help pave the path for a political solution to stop the appalling suffering inflicted on the Syrian people." The Obama administration welcomed the agreement but made clear that the use of military force is still an option.